Wednesday June 5th it is Dead Duck Day again. At exactly 17:55h we will honor the mallard duck that became known to science as the first (documented) ‘victim’ of homosexual necrophilia in that species. Please join for this short open-air ceremony next to the new wing of the Natural History Museum Rotterdam (the Netherlands) where the duck (now museum specimen NMR 9989-00232) has met his dramatic end. Commemorating the life and death of NMR 9989-00232, and [new!] announcing exiting news about the duck specimen. [new!] Reveal (1) a ‘plaque’ that marks the spot where the duck hit the building and died on June 5th 1995, and (2) expose a bilingual sign that tells what happened right after the duck had died. Communicate recent observations of / publications on remarkable animal behavior, relating to the duck. Dr Bondar will send in the DDD-Message. Read the special Dead Duck Day Message, this year written by dr Carin Anne Bondar. Discuss ways to prevent birds from colliding with glass (buildings). After all this, everybody is invited to the traditional six-course duck dinner at the famous Tai Wu Restaurant. Dead Duck Day is open to the public and free of charge. The ceremony is in the open air on the lawn next to the north wing of the Natural History Museum Rotterdam in the Museumpark (address: Westzeedijk 345, 3015 AA Rotterdam). We start at exactly 17:55h. Kees Moeliker will do most of the talking, in Dutch and in English (almost simultaneously). Usually, at about 18:25h we walk to the restaurant for the six-course duck din ner. Arrival at the Tai Wu restaurant (address: Mauritsweg 24-26, 3012 JR Rotterdam) at about 18:45h. If you want to join the dinner, please make your own reservations (telephone +31 10 4330818; code Dead Duck Day 死鸭日]. Dinner and beverages are at your own expense. [We still try to find a sponsor]. Here is the announcement of Dead Duck Day om the TED blog. 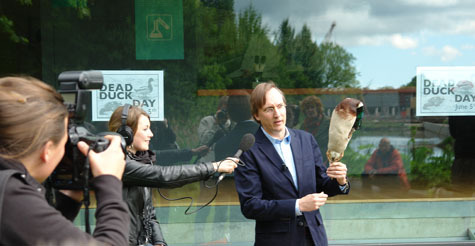 Dead Duck Day is organised by the European Bureau of Improbable Research and the Natural History Museum Rotterdam. This entry was posted in Dead Duck Day, ducks, events | lectures, Ig Nobel and tagged Anas platyrhynchos, dead duck day, homosexual necrophilia, mallard. Bookmark the permalink.